Discussion in 'Cars in General' started by GTPNewsWire, Dec 5, 2018. This article was published by Joe Donaldson (@Joey D) on December 5th, 2018 in the Car Culture category. JoueurGT, Venom800tt, IngRobNy and 1 other person like this. What is going on on the driver's side of the car? There's some sort of damage or film under the door. The F50 got a big round of applause in the pinnacle of the ICE thread a while back. It's a film to prevent scuffs when getting in and out of the car. The door sills for the F50 are pretty big and the cabin is tiny, so it takes some effort getting in. Oooookaaaayyyy.... but shouldn't they take it off for the photoshoot? Interesting detail anyway. I have a soft spot for the F50. I don’t much care how it performs because I will never drive one in real life, but they sound wonderful, which I can’t say about the F40. They also look good for the era they came from, which I can’t say about the Enzo. TS050, Rotorist, XJ40 and 1 other person like this. I have a soft spot for the F50. I don’t much care how it performs because I will never drive on in real life, but they sound wonderful, which I can’t say about the F40. They also look good for the era they came from, which I can’t say about the Enzo. 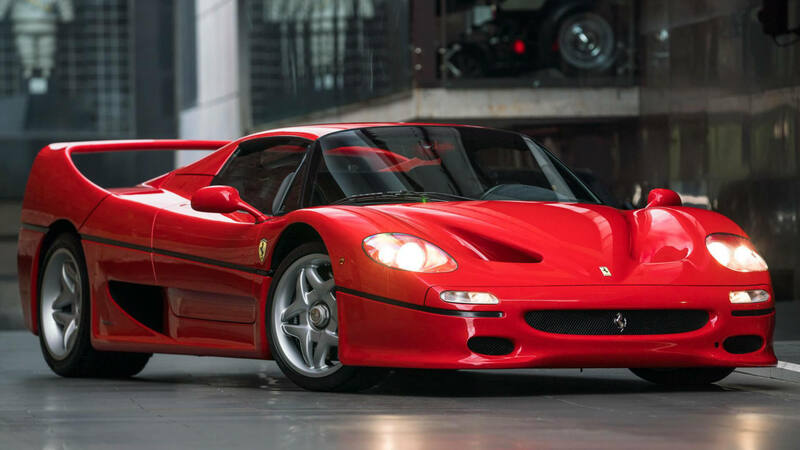 The F50 was the poster car for young me versus the F40, but even as I've grown older, and seen the praise heaped upon the older car, I prefer the newer one too. They sound incredible, and an old issue of Evo where it beat all the other Ferrari halo models at the time — along with ranking higher than them in the magazine's "best handling cars ever" list — makes me think it's the better car to actually enjoy driving. Sure, it wasn't faster than the F40 in some measured ways, but I think that's missing the point. The Enzo still just doesn't do it for me. The LaFerrari looks so much better in the metal than I expected it to, but I'd still rather have either of its main competitors. SestoScudo, xlDevontelx, TS050 and 4 others like this. Poster car when I was a kid, so none of the negativity matters. The F50 never did it for me, but my childhood bedroom posters were an F40, a Conutach, and a 959, and by the time the F50 came out the XJ220 and F1 had already captured my attention. Had it in a poster too. Always loved it, but it's tough to follow the F40 given the impact it had. Plus, it's the base for my favorite car ever, the F50 GT. DK, Rotorist and fatkid like this. So glad to finally be able to drive my beloved F50 in GT Sport. In-car view is where it is at; that "cutting edge" at the time, 8-bit digital gauge readout and the sounds! Slight minus: the rear view mode when in in-car camera mode shows the rear from the outside and not from looking on the inside. I really wanted to see that lexan engine cover and high mounted wing completely blocking my view. I don't care how impractical it is. But everything else about this car is all I was hoping for. Would love to experience it in VR. Also, it's the base for my favourite car, ever. My #1 dream garage pick: The F50 GT. 740bhp, 10500RPM of pure NA V12ness. DK, rumblina, McLover F1 and 3 others like this. I can't believe this video is now 5 years old, but it's still one of the best car videos on YT and fits perfectly with the F40 vs F50 debate. At the time I was F40 die hard, had the poster, the model, the F50 was soft and delicate, the F40 insane and wild. No contest. Over the years I have begun to appreciate the more refined nature of the F50 and feel age has been very kind to the car. Slight minus: the rear view mode when in in-car camera mode shows the rear from the outside and not from looking on the inside. I really wanted to see that lexan engine cover and high mounted wing completely blocking my view. I don't care how impractical it is. The VR tour is your friend! A distant friend. I only have a trusty "vanilla" PS4 when I would prefer to experience it on a PRO and cannot justify buying a PSVR for just the VR Tour mode and Resident Evil 7 - the only 2 reasons I would even use it for. McLaren and SestoScudo like this. If you needed to upgrade to a PS4 pro, it's not worth it, too expensive. But the experience of driving in VR kind of blew me away. Sadly, the AI opponent is unbelievably bad and I don't get why circuit experience cannot be done in VR. And here i am thinking the F40 is the ugly one,that F40 hood looks like it was slightly stepped on by a giant.I think the F50 is pretty although it does look odd from some angles because the rear is long as hell. "There was also a complete lack of storage as well." And who buys a Ferrari for Storage?Is there some millionaire out there that wants to use his F50 for shopping? Sorry, I’ll take the F40 every single time. I don’t care if it drives worse, sounds worse, etc. It had better be improved over the F40. It is 10 years newer! IMHO, the F40 is one of the most beautiful cars ever made and remains my dream car. Probably a result of building a testors model kit F40 in my youth. That said, I don’t hate the F50. I don’t think it is all that ugly, really. I guess next to the F40 it is, but I’d still take an F50 in a heartbeat. That was filmed at MSR in Cresson, TX back in 2001 for the FCA national meet. That was an awesome weekend, I'll have to dig up some more photos. Rotorist and fatkid like this. For someone who has made it clear that they dislike the F50 you sure do post a lot of messages about it. "The gentleman doth protest too much, methinks" applies possibly? Too all the open and proud lovers of this car, here is a hands on, back to back comparison from a lucky soul who gets to drive a lot of these types of vehicles. I implore you all to watch the whole video. It is worth it. You were there? Wow! Cannot wait for more pics. You legend! One of my favourite Ferraris of all time alongside the 288 GTO Evoluzione. Man I grew up with the F50, Mclaren F1, Diablo Sv and the CLK GTR. Saw the car featured in BM videos way back in the 90's, it was slower than/beaten by F40 on both Tsukuba and Suzuka, Gan-san didn't seem to like it as much as the F40, and if I remember it right, it didn't do so well at Yatabe Test track doing the usual 0-400m, 0-1000m and top speed run. I think one of the aspect BM hosts like was the sound along with the new tech on the chassis, suspension and engine. I think we're gonna look back on the F50 selling for $1M-$3M and think... man what a bargain that was back then. I didn't really like them that much until I had the opportunity to work on one. Being able to see the carbon weave through the thinly applied paint really made me appreciate the lengths they went to in order to make the car lighter.